Born in Waterbury, CT, on April 14, 1875, J. (Joseph) Farrell Mac-Donald was one of the screen’s most beloved and prolific character actors for 40 years (1911-1951). A near genius and jack of many trades by choice or accident, little is known of his teen years other than he sang in the church choir. After attending prep school in Ansonia, CT, he went to Yale University, where he played football, graduating in 1903 with a B.A. and LL.B. He also attended Stewarttown University in Stewarttown, Ontario, Canada, where he earned an LL.D. Obviously he studied law, but he also earned graduate and mining certificates, eventually joining a government geological survey through Mexico, S. Colorado and into the Rockies. His roving spirit next carried him to England where he appeared in grand opera and studied art in London, acquiring some ability as a painter, later exhibiting 18 canvases at L.A. galleries. By 1900 he was married to silent screen actress Edith Bostwick (born 1882 in Colorado). They later had a daughter, Lorna. As a minstrel singer, J. Farrell MacDonald toured the U.S. in stage productions for several years (including a stint as a baritone singer in Lillian Russell’s production of “The Princess Nicotine”). MacDonald even spent time as a police reporter on a Baltimore newspaper. Finally, at age 36, returning to NY to go into stock work again, he began to think about the burgeoning medium of motion pictures and joined Carl Laemmle’s IMP Company (the forerunner of Universal) in NY in 1911. Moving to Hollywood in 1912, within two years he was established as a lead actor as well as a director. Functioning in the latter capacity with L. Frank Baum’s Oz Film Company, MacDonald gave work to up-and-coming extras Hal Roach and Harold Lloyd. When Roach set up his own production company in 1915 with Lloyd as his star, he signed MacDonald as a director. 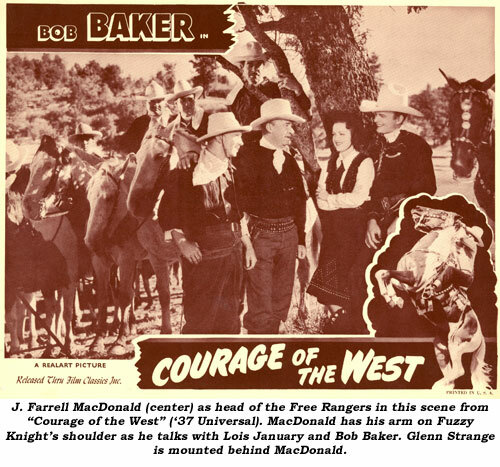 MacDonald was featured in other westerns in the teens and early ‘20s opposite Buck Jones, Tom Mix, William Russell, Bill Patton and Thomas Meighan; even starring in one 2-reeler, “The Boss of Copperhead” (‘20, Universal). 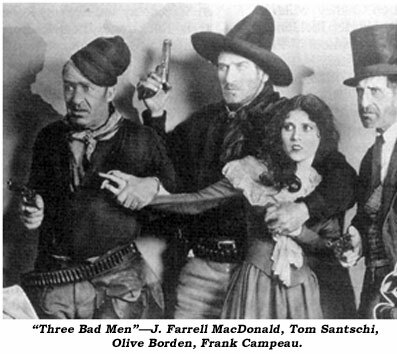 Ford selected MacDonald for the prominent role of Corporal Casey in the groundbreaking epic “The Iron Horse” in ‘24 and co-starred MacDonald (along with Tom Santschi and Frank Campeau) as one of the “Three Bad Men” in ‘26. The same year he was Wild Bill Hickok in the William Boyd epic “The Last Frontier”. 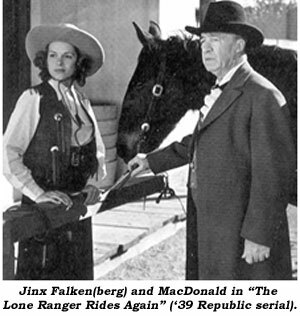 who adopts young Bob Baker in “Courage of the West” (‘37); cattle baron Craig Dolan in the Republic serial “The Lone Ranger Rides Again” (‘39); Joan Barclay’s rancher father in “Gentleman From Arizona” (‘39); stageline owner in Hopalong Cassidy’s “Stagecoach War” (‘40); and as a newspaper-man campaigning against outlawed Gabby Hayes in Roy Rogers’ “In Old Cheyenne” (‘41). He kept up his workload of five to 10 films per year into the ‘40s, often unbilled in small roles, with one of his choicest parts as Dodge City barkeep Mac in John Ford’s “My Darling Clementine” (‘46). 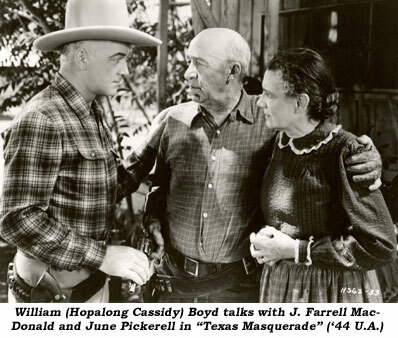 The late ‘40s saw him in westerns starring George Montgomery, Victor Mature, Rod Cameron, Alan Ladd, Don Barry, Randolph Scott, Lash LaRue and even one of the Tommy Carr directed Jimmy Ellison/Russell Hayden quickies, “Hostile Country” (‘50).